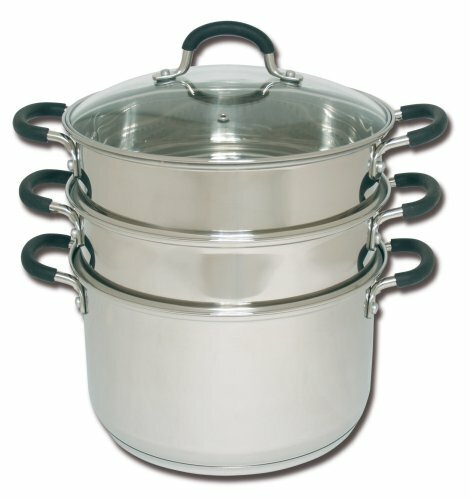 Stainless Steel Steamer Pots make a great gift for the busy cook. They actually make a great gift for the cook in any family. Our friend and Top Gifts team member, Raymond, found that using a stainless steel steamer made life a whole lot easier for him. It freed up some badly needed time. He can cook healthy, delicious food in one pot fast and easy. See his method below. Steam cooking is also one of the healthiest and best ways you can cook food. Steam cooking has been used for many thousands of years by the Chinese, Africans, and Indians. Presently, Steam cooking is a very popular way of preparing food throughout the entire world. There is good reason to give a steamer as a gift to a health conscious person. Steaming leaves more nutrition in the food to nourish your body. It is fast, easy and delicious. How many times do you throw a bag of frozen vegetables in the microwave to add to a quick meal? I used to do that a lot, particularly when I was dieting. I would grill a chicken breast and place the veggies in the microwave for a quick dinner. Like most folks, I was unaware that I was losing most of the nutrients from my food. Now that I am steaming my foods using stainless steel cookware there is so much more flavor. Healthy Food Corner reports that when you prepare your food by steaming it, the steam cooked food maintains its shape (structure), color, taste, juice, and most of its vitamins and minerals. In the case of broccoli, as an example, you retain 81% of its vitamin C when you steam it. Whereas, if you cook in water, it only keeps 30% of its vitamin C. As for flavonoids loss, steamed broccoli keeps 89% of it, but if cooked in water, it retains only 54% of its flavonoids. Microwave cooking of broccoli only retains 3% of its flavonoids. Please Note: “Flavonoids” are compounds found in almost all fruits and vegetables. They are associated with many health benefits. With steam cooking, you don’t need to add any oil (of any kind) to your food while you are steaming it. This will make your food healthier. If you choose, you can add your favorite seasonings after you finish cooking. This can include a small amount of your choice of healthy fat (olive oil, real butter, or coconut oil) spices, salt, and pepper. 3 Tier Stainless Steel Steamers and larger like those pictured here are time and energy savers. Using more than one level enables you to cook a whole meal on one burner. You do not need to restrict the steaming method to just greens and vegetables. It is possible to actually steam cook almost anything. You can steam cook fruits, vegetables, grains, legumes, meat, fish & seafood, poultry and game birds. Overcooking or burning of the food can also be avoided by steaming it. You take the food out when it reaches your desired state of doneness. If you are concerned that steaming your meats will produce a bland taste you are in for a pleasant surprise. Our Top Gift’s team member Ray (Raymond) has steam cooked for a long time and is more experienced with steam cooking than I am. Although I love steamed veggies, meats were another matter. I had not tried them and just assumed that they would be tasteless and bland. How wrong I was! I came across some YouTube videos that showed some very tasty looking steamed meat dishes. There was some fish in my freezer so I decided to try it. I put half a lemon in the water of my largest stainless steel pan and some fish fillets in a Stainless Steel Steamer Basket above the water. Then I put the lid on the pan and closed the vent. Why the Stainless Steel Steamers? Ray says “I have been using a stovetop and electric food steamers for more years than I can remember. It always seemed that I never had the leisurely time I needed to spend in the kitchen for that mouthwatering recipe – I loved to cook! But it all changed some years ago when I assumed more responsibility and found myself having even less time than before. I started experimenting in the kitchen. I needed to learn how to save some of that precious time as well as provide nutritious and healthy meals in my home. I started with pressure cookers first. The only problem was that my options were quite limited and we could not eat the same thing every day. I also tried steaming some fresh vegetables in a couple of single-tier stovetop steamers… But I still had to pull out the old pan to cook on to prepare a whole meal for us. Then I tried one of those multi-tier transparent electric steamers to see if I could cook a speedy whole meal. A whole meal for us consists of boneless chicken breasts, or salmon steaks, or different fish filets, or beef steaks, brown/white rice, and 4-5 types of vegetables. Well, after trying for a few weeks, I wasn’t happy with the taste of the steam cooked food on this electric steamer. There was also not enough room in the base water reservoir and I had to replenish it during cooking. Next, I experimented with the wok and the bamboo baskets to see if they will work for us. I was disappointed to find that the cooked meat did not have the right taste for me. The steam also was all over the place in the kitchen and the baskets were hard to clean thoroughly. Finally, a few years ago, I decided to try the stainless steel multi-tier stovetop steamers. I bought a 3-tier stainless steel steamer pot (12- Inch diameter) to see if this one would work. Well, I was absolutely amazed how simple and efficient my cooking became. I was able to prepare a complete near perfect meal for the two of us in no time at all. Everything looked and tasted great! The only time-consuming chore was preparing the fresh vegetables, fish, or the meat before steaming them. I later did correct this problem by using quality fresh-frozen vegetables. I was happy that I could place all the food and vegetables in the steamer and forget about it till it was ready to be served. How delightful! I must add that the stainless steel steamer is very easy to clean. A job that takes no more than a few minutes. It was not long before I realized that whenever we had company for lunch or dinner, there was not enough room in the 3-tier steamer to serve everyone. So, last year I went on Amazon and found this steamer. 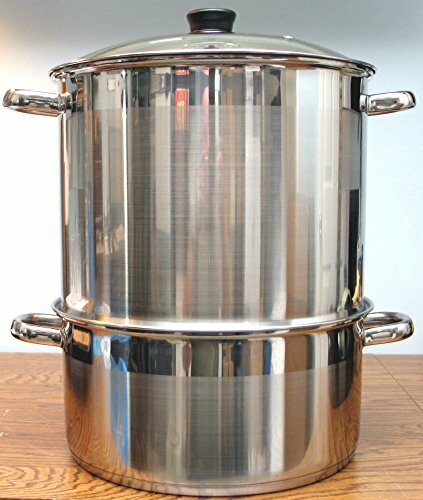 This is the Best Stainless Steel Steamer in a large size. 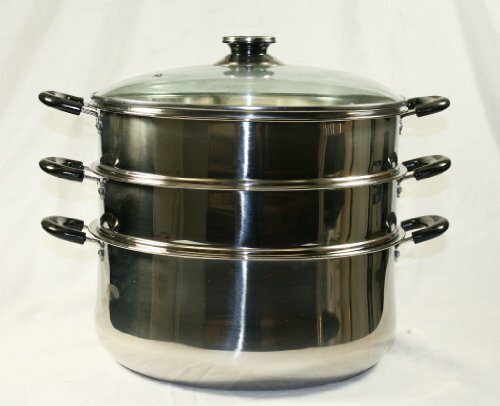 The Concord 4-Tier Stainless Steel Steamer Cookware Pot (14-Inch Diameter) is usually at a very reasonable price. I strongly recommend this Concord steamer to all those people who are not happy with their steamers. I also want those who have not steam cooked before to try this Concord steamer… You will love it! It is very simple, efficient, and a lot less messy to prepare a whole meal than the traditional way. Incidentally, did I tell you that you can use only 1, 2, 3, or all the 4 tiers of the steamer to cook? It all depends on what you are steam cooking. That is how flexible steam cooking with this superb steamer can be. Having the larger 14-inch diameter and the extra tier allowed me to make food for 2-3 more people… all in one steam cooker. That is for a total of 4 people. How great is that? 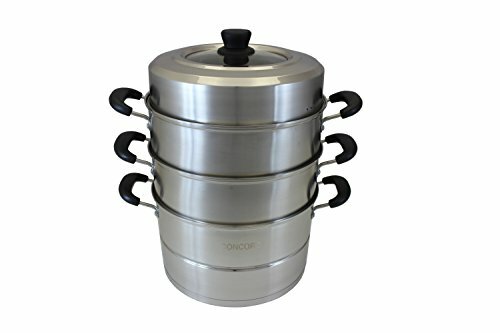 In the rare occasions of having more than 2-3 people over, I would bring out my 3-tier stainless steel steam cooker and would easily prepare a whole meal for 7-8 people. Not bad! Cooking is no longer a chore, but a speedy delight! I usually use the 3-tier steamer for the two of us, my wife and I. I fill the base water reservoir with water to about 2 inches to the top. Then I put all my green vegetables (broccoli crowns, Brussel sprouts, sliced yellow squash, cut Italian green beans, and cut spinach or kale that is in an oven-safe dish) in the 2nd tier. In the 3rd tier, I put the fish/meat/poultry (usually Tilapia Filet or Skinned Salmon/Sliced Steak/Boneless Chicken Breasts or Chicken Tenders) in an oven-safe dish. I also add a little brown/white rice in an oven-safe dish for us. I know that putting the fish/meat/poultry in the top tier is not what the cooking experts suggest. However, I have, over the years, developed a special method of my own steam cooking and it works fine for me. Fresh vegetables and meat cook much quicker but I save preparation time by using frozen. So, you see, the secret of enjoying home-cooked meals is to personalize it to the way you like it and to serve properly your household’s need and purpose. 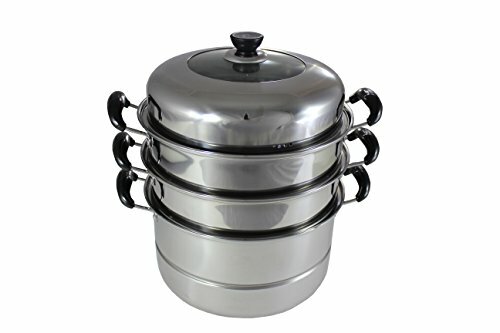 Believe me, once you cook with a good quality Concord steamer, you are hooked for life! How else can you prepare a totally nutritious meal in a fraction of the time it would otherwise take the old fashioned way? You can always buy fast food but that is never healthy. But if you want healthy food fast, you need something like this. If I were you, I would not hesitate to get the Concord 3-tier or 4-tier Steamer today! It would make a great gift for anyone you wish to treat… even yourself. Fire Magic Echelon Diamond Grill – Because You’re Worth It!